GATE 2019 Eligibility Criteria details are now available on this web page. 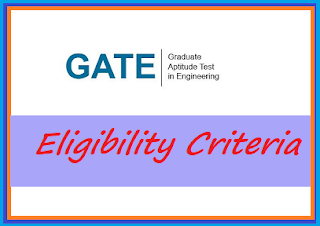 The interested aspirants who are willing to apply for the GATE 2019 Application form should check out the GATE 2019 Eligibility Criteria first. The examination has the minimum requirement that is given here. The aspirants who will qualify the criteria of the GATE may apply the application form without any doubts. So, what you waiting for? Scroll down this page to get the details about exam criteria. Every year GATE examination conducted by the authority of seven IITs across the country. A large number of candidates every year participate in the GATE Exam 2019 to qualify the examination and get the admission in the PG courses. If you are also willing to apply the application form, then check the GATE 2019 Eligibility criteria given here. The candidates should pass the required details to apply the application form for GATE 2019. To apply for the GATE Exam, the candidates at least passed graduation/ degree or its equivalent with the aggregate score. The application form submission process will start on September 1, 2018. The candidates should have passed the B.Sc. (Post Diploma/ four year after +2) or appearing in the 4th year of degree may apply for the GATE Exam. In other words, the qualification year must not be later than 2019. The candidates should have qualified the 5-year bachelor’s degree in architecture or currently appearing in the final year will eligible to apply. The qualifying year of degree should be not later than 2019. The candidates who are currently pursuing in the final year of bachelor’s degree in technology (3 years after Diploma in Engineering/ Technology or 4 years after +2) will able to apply the application form of GATE Exam 2019. The candidates who completed their master’s degree in any branch of Mathematics/ science/ Computer Applications/ Statistics or currently appearing in the final year are eligible to apply for the exam. The candidates who will complete their Integrated Master’s degree program or Dual degree program in Technology / Engineering will able to apply online. Or the candidates appearing in the 4th or 5th year also apply the application form of GATE 2019. The candidates who are pursuing 4 years Integrated Master’s degree programs in Engineering/ Technology or still appearing in the 2nd/3rd/4th year also eligible for GATE Exam. The qualification year must not later than 2021. Integrated M.Sc. Integrated B.S./ M.S. The candidates who passed 5 years integrated master’s degree program or Dual degree program in Engineering/ Technology or currently appearing in the 4th or 5th year may apply the application form online. The year of passing must be before 2019. There is no age limit for applicants to apply for the GATE Exam. All Indian national candidates are eligible for the GATE 2019 Exam. Along with it, the candidates who have the nationality of Nepal, Sri Lanka, Bangladesh, Singapore, Ethiopia, and United Arab Emirates (U.A.E.) also can apply for the GATE. Thank you for visiting us. Wish you Good luck. Have a Nice Day!